Antiques experts travel the UK searching for treasures. Paul Laidlaw and Thomas Plant kick off in Cromer and make their way through Holt and Norwich to the auction at Colchester. The aim? To make the biggest profit at auction but it's no mean feat. -Should be a good one. and our two auctioneers are basking in success. We're totally up for it. Both have come away with profits in the last auction. It's all ahead. The sun's shining, cool car, we're suited, booted, feeling good. but he's remaining vigilant and is taking it all very seriously. I'm a disappointment to myself. -Challenger, Thomas Plant, is playing catch up. And he's gaining ground, coming out guns blazing. Every auction is like going into the ring with Laidlaw. There are these little nips I do. You keep punching me in the shins, that's the problem. he's turned £200 into the £399.08 he's got to spend today. converting his initial £200 into the huge budget for today of £899.78. strain relations in the old Sunbeam Alpine. -Sorry, sorry, sorry, have you got this air of...? It's gone to my head! £900 in your back pocket. I could have been killed for that kind of money! in the county town of Bedford, covering around 600 miles. and making their way to the auction in Colchester, Essex. -Do we get to see the sea at any stage? -I think I get to see the sea. -Where are you off to? and still an important part of the local area's economy. -Hi, Thomas, nice to meet you. I'm Phillip. Hi, Phillip, nice to meet you. Where do you buy most of your stuff? -Well, if I told you that I'd have to kill you. before getting into antiques, so he's a well connected man. lose the money you've gained, and you want to buy with a definite profit. There's so much pressure right now. You don't want to make a mistake. Thomas, there could be opportunity aplenty here. -That's quite a nice thing really, isn't it? -I like the sunken handles on the side. I like the rawness of it. signs of age and no ticket price but Thomas is tempted. We've done all right with boxes this trip, haven't we? Maybe the box is coming back. On the last leg, both experts made profits with boxes they bought. So, he could be on to something here. -What's that extraordinary number there? That's got Cornish serpentine in it. It's silver. -aren't they, down in Cornwall? by Prince Albert in the mid-19th century. This piece was made into a brooch about 100 years later. -That's not bad. What have you got on that? 48.
but whether it's going to make anything at auction, that's another matter altogether. he could pin his hopes on including those made in memory of a loved one. Very popular with the Victorians. and utter devotion and love that's gone into this one piece. for their hair to be taken and plaited, mounted in a gold brooch. it and dated it and given the date of her death, and the age she was. So, Phillip's dangling the two brooches and the box. Will Thomas take the bait? -I've got 55 on that. -That can be a 50. -That box has got to be £50. -Has it got to be 50? -It's got to be £50. -Because I'd be making a loss. -I don't want you making a loss, do I? Can it be 45? -I'll do it for 48 for you. I like the four in front. No arguing with that, there's no point. This is my sticking point but to me that's worth £35. -I'll knock a tenner off, make it 38. Come on, Thomas, don't embarrass yourself. -I can add it up. 136. -Do you want me to round it down? 135. -Because it makes life easier for me. I knew I'd get you! Hook, line and sinker, eh, Thomas? -This is the first time I've gone big. thrilling experience in the market town of North Walsham. that dates from the 17th century. But today, Paul's concern is a newer addition to the area. An attraction that charts the often mystifying art of magic. who have made magic their business for over 100 years. Paul's come to meet Roy to discover the tricks of the trade. It's an absolute replica of my great-grandfather, Lewis Davenport. He was the man who started it all off in my family. and becoming a noted performer. resulted in a spectacular collection now preserved in the museum. the first published material on conjuring. was the difference between life and death. at that point, was very grey indeed. I can't understand, you must be a witch. Then we come to Scot. witchcraft in a good way and so on. and chapter 13 was an actual description of magic tricks. Not so much as how to do it at home, it was more expose. It was like, this is how they do it. meaning this first edition is one of only a handful left in existence. this book influenced generations of magicians. when a French clockmaker took it off the streets and into the theatres. He's actually known within the magic world as the father of modern magic. You know how magicians think it's up the sleeve? and everything went up there, basically. Geese and everything. Then he was the man who went into modern garb. Now, he was famous for his mystery clocks. and telling the correct time but there's no visible way it can work. That's glass but it does keep correct time, absolutely. Robert-Houdin altered the landscape of magic dramatically. better know later as the escapologist, Harry Houdini. magic still courses through the veins of this family. -What are you going to show me, Roy? where my great-grandfather started off all those years ago. We take a bit of magic and make a ball appear. There's the ball. Or we take some magic where you take the ball and it's gone again. Back in the hand. And a handkerchief, here we are. Take the ball, in it goes, in it goes. All I need you to do is to give a little blow. Blow. Ah! Well done. You've got the magic touch too. Have I got that wonderful assistant thing going on? -Fishnets, I can see you in them! -This is one of the best, I assure you. I imagine your driving companion would have something to say about that. -I do have one piece of magic to show you. -Oh, yes, let me see! No, no, no! Let me guess. You're going to make my 399 into 100. And it will involve no top hats or rabbits. They're en route to the market town of Holt. by a great fire in 1708 and was rebuilt in the Georgian style. This looks like a cracking place for an amble. It's great. It does. I hope it's not too expensive. Well, I'm not going to concur! -I've been here before so I know what it's like. -Have a good one, big man. The nine rooms of Shirehall Plain Antiques are managed by Mandy. -Very good. How are you? Lots of different dealers here all renting a room. I think you have a good chance of finding something floating about. There are some divine items in here. I don't think I'd make a very good vicar. Not a very good vicar, priest. Man of the cloth. There he goes, dressing up again. -I should really get on and buy some antiques. -Not a bad idea, Thomas. This is pretty, a little clover leafed pendant. -Do you like that, Mandy? -I think it's very sweet. -It's very pretty, isn't it? Oh, he likes this and it's only £5. spell out the one and the five and then a CT at the end of the lozenge. So that's 15 carat gold. or making items of 15 carat gold, in 1932. I will buy that for £5. I'm not going to haggle at all. but there's definitely a good profit in there. And it's pretty as hell. That is dead sweet. This has turned out to be a lucky find. It's gold, 15 carat gold. but it's going to make a good profit so I'm really pleased. Things are looking good for Thomas. Paul is pressing on in search of his own four leafed clover. He's making the short journey to nearby Fakenham. that dates from the 14th century. today is housed in a former church. -It's good to see you. Anything you want to know about or any help you need, ask. That's great. That's tremendous of you, David. Thanks very much. It has a great story that I can enjoy. It has no issues and it's got a profit in it. if it ticks those boxes, no problem. And I won't be shy in spending the money. So, the hunt is on for the perfect piece. I'm polishing off too many of these rooms too quick. although that shouldn't pose a problem to such a lover of the stuff. and it's cut with that rather snazzy looking hound. I think it's great fun. I love Orrefors glass. This vase is by the Swedish company, Orrefors, dating from the 1960s. It has a ticket price of £48 but the owner, Colin, isn't here right now. I would buy the Orrefors vase at 30. It's a bit off, I know. I think it's a long way off but I can always ring him and see. but can he get it for the right price? Paul, I have spoken to Colin. couple of pounds so that he can deal with you? I'm not falling out with anybody over a couple of pounds. -Got a deal at 32. -We've got a deal at 32. Thanks for your efforts and say thanks to Colin, yeah? I think you can afford that, Paul. and just in time as day one of the road trip draws to a close. The last thing I bought was brilliant. It was something I knew about, they didn't. -You know, it's just one of those things. -Is there a profit in it? Don't say, "oh, yeah," like that. What happened to confidence? Wait a minute, pull over. -Is it coming out of your left arm? and it's not all Thomas picked up yesterday. There's also the sewing box and the two brooches. In total, he spent £140 which means he has £259.08 to spend today. Paul only parted with £32 for the glass vase. So, armed with £867.78 he's got his sights on the shops. This morning they're starting in Norwich, the county town of Norfolk. Norwich is steeped in history. If you can get there of course. -Have you got that feeling that I could be lost? What are we going to give this before we ask someone? -I mean, maybe after an hour. Come on, chaps, get it together. but it's not exactly in the right spot. -Why are you looking at that wall? -Yeah, and there's the pavement. Whoa! Did you get shorter or is there a big drop behind there? There is a drop! I didn't expect it! This is how a gentleman does it. Ah! I'm in the void! -That's one way to do it, chaps. Their destiny awaits at Aladdin's Cave. 16,000 square feet of antiques. Basically, I haven't grown up. Have that, Laidlaw! Four items down. Four items. What have you got? One. Cos I was quick! as my compadre because all I can hear is him muttering. Yes. Thomas, do behave! You're even distracting your rival. Something's got to change, I've got to get my game head on. cowboy holsters, pretending to shoot Paul. Next I'll be stalking him, behind him, doing a leopard crawl. With four items already, he really is taking it easy today. Can I have a look at this bowl in here, please? Ah, something to buy and not try on at last. Ha! Ticket price says £22. It's quite a nice bowl for one's nuts. and you've got the Egyptian sign there. I would say early 20th century. What's the best on that, please? -15, because I like to keep figures nice and round and simple? -Leave that with me, I'll see what I can sort out. which I know is very mean but that's life. -She will do that for 15 for you. -I'll give you some change. He's pretty pleased with himself but that's not new. and if there's one thing Paul knows about, it's militaria. A propeller tip photograph frame, price is down as £8. That's pretty fair retail, isn't it? That's a pair of early goggles. First World Ward period but with a higher price of £55. What's the story with the pair of them, then? -That's where I've got the problem. -I can do you a deal. I'll do you £40 for the two. You've just done the deal. Eddie, you're a good man. Easy, wasn't it? Our military man's over the moon. The photograph frame is as it is. ..not a lot of people know that. when you're taking to general auction. So, a photo frame and a potentially valuable set of goggles for £40. for an area that has such close ties with the RAF. have played a crucial role in Britain's air defences. radar stations in the country. became essential to defences by the Second World War. to meet manager, Chris Morshead. Chris, nice to meet you. This looks fabulous, this place. -Is this a radar station? -Certainly is, yes, dating back to 1942.
became a key area to defend and so a new response was needed. was limited especially as the speed of aircraft were increasing. a top secret mission to control the new battlefield in the sky began. to help develop an air detection system. first put theory to the test. when it approached them and they could detect it when it flew away again. stations to monitor the skies around Britain including here at Neatishead. this so-called Chain Home system was fully operational. Chain Home. Why is it called Chain Home? -so that's the depth of it really. -And, so, what am I looking at here? -goes up into the transmitting aerial. -So, this is the boost. It boosts it all up. What receives it then? pick up any contacts coming in. This technology became vital in 1940 during the Battle of Britain. in their counter attack but even then the system wasn't perfect. and it had a number of problems associated with it. to understand today talking about radar. scrambled against the Luftwaffe raids. ending Germany's plan to invade. -winning the Battle for the Skies? It acted as, what we call, a false multiply. where they were needed in front of the oncoming raids. improved computerised radar stations to match the threat. Thomas isn't leaving here without having a go. Who would I be speaking to if I put these on, or listening to? As a fighter controller you'd actually be talking to an aircraft. then carry out an intercept on an unknown aircraft. Roger, 280. Intercept, identify and report. Wow, this room's unbelievably amazing. It's like a Bond set. and now he fancies himself as James Bond. back in Norwich who's visiting Looses Emporium for his final shop. the biggest antique centre in East Anglia and they could be right. -Nothing taking your fancy, eh, Paul? Mm. A budget of more than £800 and he's still struggling. Perhaps Patrick can help him out. Well, this Art Nouveau bust sure has cheered him up! -What would you ask for that? -I'm asking 280 for it. -No, unfortunately, but she's an interesting lassie. She's too rich for his tastes. -Your official constable's truncheon. Is that what it is? Rochdale Special Constabulary. Yes, somebody's long service. I'll do that for £45. The price you've quoted, you must have slack in that? -You wouldn't have waded in deep on that. I'm going to offer you, it's real money, I'm backing it up. -You're haggling over 15 quid. A straight two and I'll get them and I'll walk out the door. -Yeah, how's that grab you? -Patrick, you're a good man. for a well discounted price. That's given our boy a bit of a boost. That's a craftsman. Look at that. and this 1940s child's chair seems to be doing the trick. -That's got £38, what can it be? -£20 and that is it. -That is it. Done, done! -Great. So I owe you 220. With £220 spent, Paul has five items. I think he's rather proud of them. But what will they make of each other's purchases? They're meeting in Coltishall for a big reveal. -You ready? Me to reveal first. -A silver bowl with an inset...? That Egyptian coin is one of the rarest types of that coin. -You mean, it's a bowl for your mints? -Yeah, it's a very rare mint. -What will that bowl do? £30 or 40? You're looking very smug. You said you've had a very difficult time. but I've pulled those rabbits out of the hat and that. -It's a beautiful child's chair, isn't it? Hitty, missy, eh? Is that a technical term, Paul? -Foundry mark stamp to it. The nose is quite big, Laidlaw. -Was that catalogued as spelter and you got that for £65? -No, I had to pay for that. Add a one at the beginning of that. -I've paid the money for it. -What are these? Flying goggles? -of binocular to the Royal Flying Corps. -And how much were those? -But it's niche, it's so niche. -They're great. You've got profits across the board. Profits, possibly, but do their real opinions pack more of a punch? and I'll come out on top again. You know, I think we've both got really good lots. It's going to be a really good auction. but I think he quite likes the box. He did say he liked the box. The question is, will the buyers at the auction? so back in the Sunbeam the boys face another impending battle. I haven't had...I don't hold out much hope. They are making their way to Colchester, in Essex. Colchester claims to be the country's oldest town. and an impressive Norman castle. Look at that, an old ruin. -Look at that, they're city walls, surely. Thank you, driver, are you going to have both these parking places? I think I parked rather quite well, actually. Let's make £1,000. Let's make £1,000. -Like we did last auction. They're going in with high expectations. So does auctioneer, Timothy Medhurst, share this enthusiasm? The goggles, as well, a nice combined lot. I'm sure they'll sell well. Probably £60 to £100 - hope for the higher estimate. I'm not sure it's going to appeal to a lot of people, unfortunately. and it looks like she's got a growth. That might play against it, I think. Today Paul is offering up five lots at a total cost of £292. Thomas also has five lots that cost him £155. take it away, Timothy! Great name! Number 9, the Egyptian white metal bowl. We're starting with Thomas and his Egyptian bowl. Nice bowl this one and £30, start this one at £30. It's worth 30. 30, 32 - new bidder. 38, then. Selling then at £38. That lot went right over his head. But Thomas has got another £23 in the kitty. let's see how Paul's glass vase fares. £30 to start this one. 30, straight in. Thank you, sir, at 30. 32, new place. 34. 38. At £38 down here now at 38. Back in? No! 42 at the back. With you, sir, at £42. There's a bit of profit to that, Paul. Now for Thomas's lucky little find, the gold pendant. £40 start it, £40 the pendant. Pretty pendant here at £40. -30 and away. 30 bid. Lady's bid at 30. 32, 34, 36. This margin man keeps getting stronger. but Paul's not taking this competition sitting down. And £20 to start the chair here. £20, for it. 15 then away. £15 for it. 15 bid, third row. The lady's bid of 15 now. 20, 22. Lady's bid, third row, then. With you, madam, seated then at £22. but it won't make him any money after costs. Can the first of Thomas's two brooches do any better? I think the mourning brooch is going to make the best one. £20 to start the brooch. £20 to start the brooch, here at £20. 15 and away. 15 bid, lady standing at 15. 16, new bidder at 16. 18. £20, standing then at 20. Mmm, a loss of £17 isn't helping anyone but it is hideous. -I'd say I was feeling your pain. -No. You don't care, do you? Is he about to feel the pain of Paul's truncheon, as well? I have a commission bid, start with me on the book at £40. £40 for the truncheon, at 40 with me. On the book 42, anywhere else? The truncheon here now at 40. 42, new bidder. 44. At 44. 46, 48, 50, 55. At 55, still with me now. 60 and I'm out. Profit is climbing slowly upwards. We are heading towards that £1,000. Next is Thomas's Victorian mourning brooch. I hope this one does better than the last. I have a commission bid to start with me at 20. At £20. -Some girl's bid at 18. At £20, 22, 24, 26 - I'm out. 28, new bidder. 30, 32, 34, 36. At 36, come in now? At 36, 38, 40. At £40 furthest from me at 40. I'll take two anywhere. 40 then, with you sir, standing at £40. Oh, that means both brooches have made a loss, I'm afraid, Thomas. I hope Paul's lovely lady fares better under the gavel. I have a commission bid with me to start at £60. 55, I'm out, down here. Gentleman's bid of 65. -It's going to do it, it's a good find. 130. At 130. 140, 150. 160 back in now. At 160. 170. Standing then, furthest from me, then, at £170. That's a loss of over £25 once the costs are deducted. He won't be happy with that! -It's not fair, is it, Laidlaw? It's not fair. Thomas's last lot is the sewing box he bought in Cromer. This box here has to make back the money I've lost and more. -It owes me, big style. 60? £60 for it. It's well worth £60. 60 bid. 65, seated. 70, 5, 80, 85. With you, sir, at 85, then. All done. A decent profit, at last, but is it good enough to forgive Phillip? Are you going to phone him and tell him? I'll do more than phone him. I'll do more than phone him. Stop plotting, fellows, and turn your attention to the last lot. but do the buyers know just how special they really are? A nice, little lot this one. I have commissioned bids to start with me at 32. At £32, 34, 36, 38 - I'm out, down here now. 40, new place. 42, 44, 46. You've got some serious buyers here. Serious, doubled your money, 70. -They know what they're buying. At 100, 110 back in. I'd say that's pretty good going. Another £90 profit for Paul. Our work here, Thomas, is done. I think we both made profit. I mean, I've lost a couple of profits and then made a couple of things. So, you know, the margin game played. £423.66 to spend next time. of £55.68, he goes forward with £955.46. Will he be able to make 1,000? -This is it, one more bite at the cherry. -One bite at the cherry. -That would be lovely. More margins to be played! Next time on Antiques Road Trip, Paul feels the pressure for buying for the last auction. And Thomas tries to take the glory in the final hour. Nip it at the last with the help of the Masons! 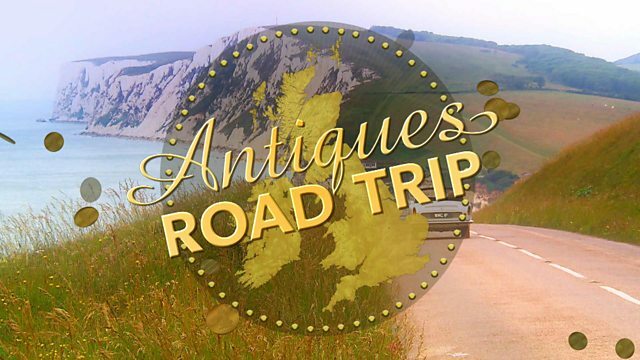 On the fourth day of their road trip Paul Laidlaw and Thomas Plant kick off in Cromer, Norfolk and make their way through Holt and Norwich to the auction at Colchester, Essex.